I’ve lived in the Rochester area for twenty six years and have been visiting Finger Lakes wineries for twenty four of those years but yesterday was the first time I had visited Casa Larga Vineyards for a wine tasting. Casa Larga is in the Rochester suburb of Fairport. I must have driven past the winery a thousand times but I’ve never stopped in for a tasting or to buy wine. The only time I had ever been in the winery had been for a company Christmas party and perhaps a wedding reception or two. I’ve driven hours to visit wineries while I had a fantastic winery fifteen minutes from my front door. This all occurred to me while on a wine tour in the Seattle suburb of Woodinville. While on the tour, I thought how different this these wineries seem as compared to the wineries back in the rural Finger Lakes region. 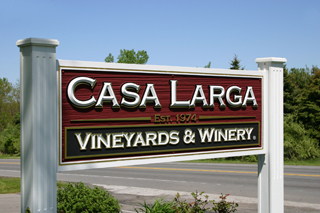 Then it dawned on me that Rochester has a very popular suburban winery, Casa Larga. When I looked back upon that moment I decided I was going to visit Casa Larga as soon as I got back to New York. This past Sunday afternoon, my girlfriend Katy and I got in the car, along with my dog Sierra, and we headed for Fairport. I didn’t need a map. I knew exactly where to go. It didn’t take long. Like I said, I’ve driven by there a thousand times. Fifteen minutes on I490 to Bushnell’s Basin then Garnsey Road straight to Casa Larga. While on the way, I tried to put it out of my head that I was familiar with the winery and tried to think of it as a new adventure, just as Woodinville had been the week before. As we came up the hill on Garnsey Road and approached the winery, the first thing I noticed was the vineyard. 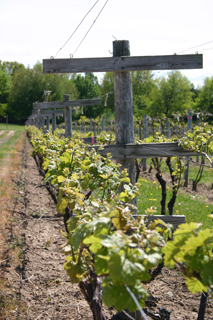 There were acres and acres of uniform rows of grape vines growing along the trellises. The leaves were in their early stages of development and barely noticeable from the road. Next, the winery came into view. It’s a lovely building. There are actually two buildings. One looks like it’s used only for production purposes while the other is the main building that houses the tasting room, wine store, banquette facilities, and production facilities. Katy and I took a look around the grounds before going inside. There were lilacs in bloom across Turk Hill Road. There were a couple of benches and picnic tables under some shade trees adjacent to the parking lot in the front of the building. Katy sat down while I attended to Sierra and wandered around taking photographs. I noticed the parking lot was full and there was an obligatory limo parked near the entrance. We walked around back and admired the view of the vineyard with the Rochester basin in the background below. It was a spectacular view. Fortunately there’s a large deck out back so guests can easily enjoy it. We received a warm welcome as we entered the building. There were a few people at the tasting bar and a few more browsing through the wine shop. I was happy that the tasting room wasn’t full as I had feared when I saw all the cars outside. Apparently there was a party going on in one of the banquette rooms. That explained the full lot. We were greeted at the tasting bar by Julie, who would lead us through a tasting as well as doubling as the winery tour guide later on. Julie was very pleasant and knowledgeable. She gave Katy and me a tasting menu and asked us each to select five wines to taste. There were over a dozen white wines and nine reds to choose from. Katy and I decided we would stay with the whites as we made our selections. One thing that caught my attention was the number of Chardonnays on the menu. There were five, three of which were oak aged, one was a blend of oak and stainless steel aged, and one was aged entirely in stainless. This was a treat for us since we both enjoy oaked Chardonnays. We sampled each of the oaked Chardonnays, the two Rieslings on the menu, and the 2008 Gewurztraminer. Okay, that was seven wines. We selected our five but Julie poured us the two oaked Chardonnays that we didn’t choose so we could compare them to our selections. This turned out to be important because each had their own unique characteristics defined by the type of oak they were aged in (French, American, and Hungarian). While I’m not going to review the wines in this post, I will mention that we could definitely taste the difference in the three oaked Chards. The French oaked had the most buttery texture and was very smooth and well balanced. The American oaked had a rich smoke component and the Hungarian oaked had a subtle smoky flavor and was slightly tart as the green apple in the description suggested. I liked the American oaked the best while Katy preferred the French oaked Chardonnay. We were pleased with the quality of each of the wines tasted. My favorite was the CLV Chardonnay (the oak/stainless blended Chardonnay) and Katy’s favorite was the 2008 Riesling. I asked Julie if Casa Larga had a wine club. I was curios because the Woodinville wineries made it a point to talk about their clubs at the start of their tastings and Julie hadn’t mentioned one at Casa Larga. She told us that their club was called the Wine Lovers Club and that members receive discounts on wine purchases and tickets to winery events along with several other perks including free tastings for members and two guests. At $35 for a one year membership, it sounded like a bargain. We had a few minutes after the tasting before the winery tour started so we took a look around inside the rest of the building on the main floor. There’s a balcony area above the tasting room with chairs, couches and a fire place. It looked very cozy. We didn’t get a good look at the banquette hall since the private party was still going on. Julie led a half dozen people out to the vineyard to start the tour. 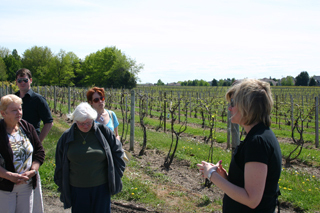 She gave us a brief overview of the wineries history and talked about the grapes, how they are grown and harvested. Next, we went inside to see the production facilities. Julie explained the entire process of pressing, fermenting, racking, aging, and bottling as she led us through the different production areas. I was impressed by the size of the facility and the number of barrels in the cellar. I never did ask the number of cases produced each year (note to self). The tour was like many tours I had been on at other wineries but I appreciated the attention to detail that our guide exhibited as well as her level of knowledge and eagerness to answer questions. She was full of enthusiasm for the winery and the wine. After the tour we purchased some wine and Katy joined the Wine Lovers Club. I was about to join but the cashier told me I could come as Katy’s guest. Katy agreed after informing me there was a price associated with that privilege. I humbly acknowledged that fact. Katy even gave me her extra club member’s card. I will pay dearly for that. I am very impressed with Casa Larga. They have an excellent reputation that is well deserved. Their wines are first rate, their winery is beautiful, and their staff is friendly and helpful. It’s too bad it took me so long to appreciate my local winery. I look forward to many visits and to examine each of their wines in depth. As WLC card carrying members, Katy and I will definitely be back soon and often. This entry was posted in 2. Wineries and tagged Finger Lakes, Wine, Wine Tasting, Winery. Bookmark the permalink.